This ground flour is consumed mixed with milk, boiled water or yogurt. In India, Ragi recipes are hundreds in number and even common food stuffs such as dosa, idly and laddu are made out of ragi. Shipping Cost $7.99 Buy multiple items online from Desi Wholesale to SAVE on shipping. This item in Gourmet Indian Food category was first added to our catalog on 03-26-2016. 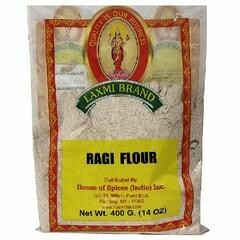 Buy Laxmi Ragi Flour 14oz (Finger Millet), sold & shipped by Desi Wholesale where you can shop online for Quality Indian Groceries, Spices, Dals & Snacks @ Lowest Price. This Gourmet Food collection has been tagged as bread flour, finger millet aata.